The Actions dialog is pictured below. (Depending on the features of the monitor being configured, the dialog may look slightly different than the one pictured below). On the left are shown all of the actions that are attached to this specific monitor. When the monitor 'fires actions' it will run that list of actions in the order shown. You can change the order with the blue up and down arrow buttons. On the right is a list of all actions that are defined so far. These actions could be used by any monitor. If you need an action that isn't listed (for example another email action, or a Start Application action), click the "New ..." button above the list of global actions. You can edit actions in this list, and changes made will be reflected in every monitor that is using that action. Some monitors see discrete events -- a file is accessed, an event is written to the Event Log, etc. Others see conditions -- disk space is low, ping response is too slow, etc. The following describes how State and Event monitors differ. State monitors keep track of whether the monitor is in a healthy state or an error state. For State monitors, you can choose to have actions run when a problem is detected, and then not again until it is fixed. State Monitors also support event escalation and error resolved actions. Event monitors run actions every time they see something wrong. You can control what actions are run and when. State monitors can be configured to act like Event monitors, meaning you can choose to be notified every time an error state is detected. This is what the radio buttons near the top do. 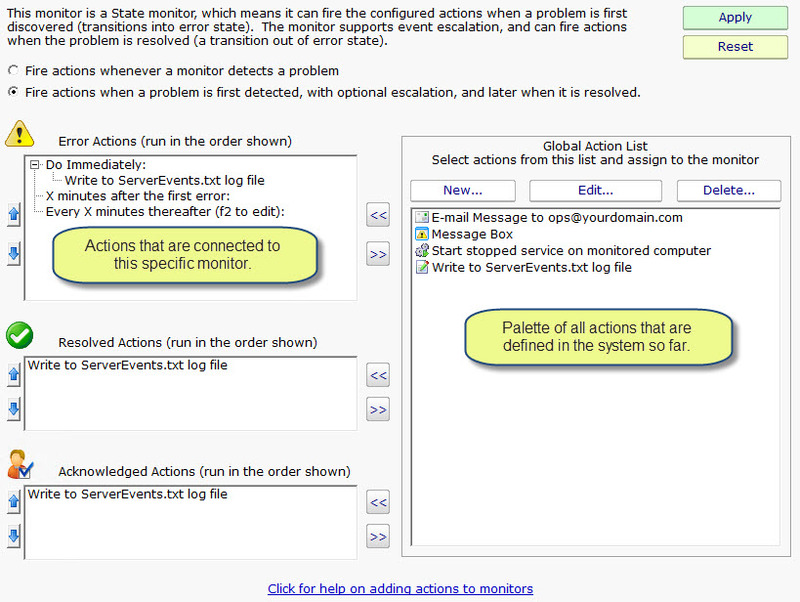 With these differences in mind, the dialog above shows the action configuration dialog for a State monitor. Only state monitors support event escalation.